For a new IP, Kingdoms of Amalur: Reckoning sold incredibly well, but not well enough to save its developer. 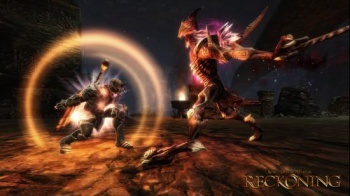 Despite selling 1.22 million copies in its first 90 days on the market - an impressive amount for a new IP from an unproven studio - Kingdoms of Amalur: Reckoning has left developer, 38 Studios, deep in the red. The developer owes the Rhode Island Economic Development Corporation some $50 million dollars and, as of Thursday afternoon, has laid off all its staff. So how many sales does Amalur need to reach to recoup its costs? Three million, according to "experts" contacted by Rhode Island Governor, Lincoln Chafee. It's unclear where Chafee's experts are getting their numbers from. Even a fairly low profit margin estimate for 3 million sales produces enough to pay back 38 Studios' loan and then some, and that's not even counting the fact that expecting a company to pay off a $50 million investment loan in the space of one game is ridiculous. At this point, 38 Studios is left hoping that a potential partner will step in and help them complete "Project Copernicus", the Amalur-themed MMO into which the studio has invested most of its loan money. That outcome seems unlikely, especially now that 38 Studios and Big Huge games have laid off their entire staff. So what was all that work worth? Well, according to analyst Michael Pachter, the "Project Copernicus" IP is worth a mere $20 million dollars.